Shows from A to Z. FOX NOW has a nice Featured selection where you can browse for something new and interesting. But, if you know exactly what you want to watch, head over to the Shows section. All of your options are arranged in alphabetical order which makes finding your show extremely easy. Then, check out the seasons and episodes or view clips for a quick glance. It seems that FOX has some pretty good content in terms of their own television shows these days, but the problem is that your schedule conflicts with the times that your favorite shows air. Don't worry though! 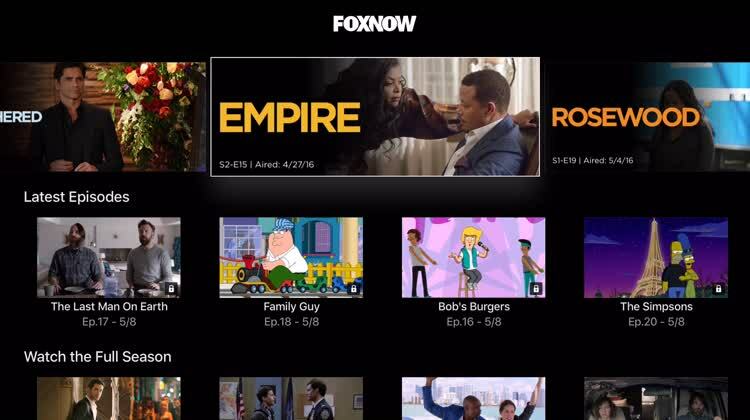 FOX NOW is an Apple TV app that lets you watch new episodes of your current on-air favorites a day after they air, so you don't have to miss out for long. Plus, the app also has a back catalog of recent episodes so you can catch up with whatever you've missed on your own time. But you'll have to be fast — this stuff doesn't stay on forever. FOX can have some great shows on the air, but it can be hard to keep up with everything the moment they air. The FOX NOW app lets you catch up with fresh episodes just a day later and you can even catch up with the latest episodes from the back catalog. It's a great way to stay on top of your favorites. Watch new episodes of top FOX shows live - The Passage, Last Man Standing, Rel, The Cool Kids, and more. Plus stream live sports with FOX Sports. Also stream episodes of your favorite adult animation - The Simpsons, Family Guy & Bob's Burgers. For more info, visit http://ask.foxnow.com or tweet us @FOXNOW.